Tokyo, April 3, 2014 – Fuji Heavy Industries Ltd. (FHI), the maker of Subaru automobiles, today announced that the all-new "Outback" (US specifications model) will make its world debut at the 2014 New York International Auto Show (Press day: April 16 and 17; Open to the public from April 18 through 27, 2014). 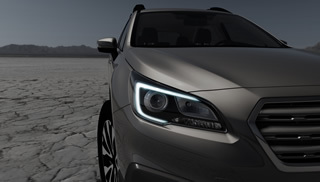 The Outback will be unveiled at the press briefing scheduled for 10:55 AM EST on April 17 at Subaru booth following a speech to be made by FHI President & CEO, Yasuyuki Yoshinaga. The all-new Outback is Subaru's flagship crossover model which blends Car-like handling and SUV capability. The special site opens today at 22:00 (Japan time) on the Subaru Global Site. The site will feature information updates relating to the New York International Auto Show including Subaru's press conference.